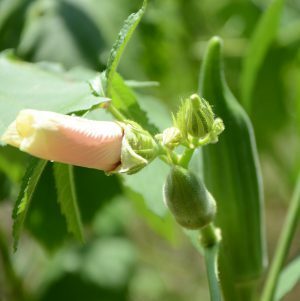 Okra will bloom throughout the heat of the summer and produce pods on an almost daily basis. Once established, the real chore is keeping up with the picking. The heat and humidity have taken its toll on most garden plants in Wakulla County. Whatever was left was attacked by a bumper crop of caterpillars and grasshoppers. There is one heat hardy, insect resistant vegetable plant which is continuing to bloom and produce. Okra (Abelmoschus esculentus) plants are still delivering the tasty pods which are the basis for numerous Southern side orders and gumbos. The origins of this widely popular vegetable are claimed by several cultures in south Asia and western Africa. The term okra is a modification of a tribal Nigerian identification for this vegetable. The first written records of okra occurred in Egypt about 1000 years ago. It proved to be a consistently long season crop with tolerance for a variety of soils with the ability to deliver satisfactory yields. The vegetables popularity assured it travelled both east and west along trade routes to reach new cultures and a variety of applications. By the mid 1600’s okra had reached the Western Hemisphere being brought to Brazil by the way of Portuguese sailors. Within 60 years okra was being grown in the American colonies. Even Thomas Jefferson made note of its successful cultivation in Virginia. Today okra is an important vegetable crop in Miami-Dade County which annually grows 1000 to 1500 acres and is sold nationwide for the fresh market. Yields of this handpicked crop range to more than 1000 bushels per acre and it is the only crop which is harvested there 12 months a year. 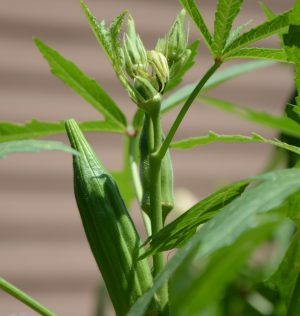 While usually grown as an annual in Wakulla County, some warmer regions grow okra as a perennial. It is in the same plant family (Malvaceae) with cotton and hibiscus which are also grown both as annuals or perennials, depending on the latitude of the planting. Locally grown okra will remain productive through the autumn. It will sustain frost injury when temperatures drop to 3 °F below freezing. From a nutritional and health standpoint, okra is low in calories, fat and cholesterol free. It is an excellent source of vitamins A and C and fiber. Okra is slippery when boiled, but is especially popular when served tomatoes. It is also fried with corn meal or pickled for use as a garnish or in salads. When shopping for fresh okra or deciding when to pick from the garden, select pods which are two to three inches long, firm to the touch, are bright green and unblemished. Fresh okra will store well in the refrigerator for two to three days, retaining its peak quality. Fresh Okra will store well in the refrigerator for two or three days. Growing is easy and inexpensive. A dollar’s worth of seed will yield many pounds of usable vegetable, just be ready to pick it daily in the heat of summer. The BB sized seed require full sun, water, and moderate amounts of soil nutrients. Stalks are capable of growing over six feet in height by August. The okra variety in the UF/IFAS Wakulla County Extension demonstration garden is Clemson Spineless. It is a commonly produced open pollinator variety and quite popular in the Southeast. To learn more about growing okra in Wakulla County, contact the UF/IFAS Wakulla County Extension Office at 850-926-3931 or http://blogs.ifas.ufl.edu/wakullaco/ . Visits to the demonstration garden are welcome 8:00 a.m. to 5:00 p.m. weekdays.